Backpacking Kenya. Mararal and the samburu people. If you are planning a budget trip in Kenya, here you can find useful information about Mararal. We went there by public transport, slept and ate in local places, and enjoyed this autenthic and remote Kenya. Back in time! GO! Mararal is one of our favorite places in Kenya. We liked it a lot because it gives you the the opportunity of seeing another Africa, without going too far away. Real Africa adventure! 100% recommended! First, if travelling by public means, you will have to jump in a truck-bus on a dirt bumpy road (they are just starting a new road, maybe things will change...). 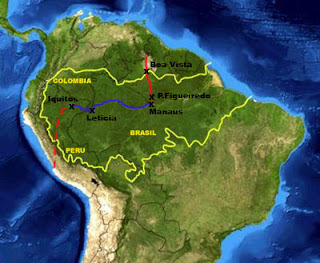 Second you will cross infinite African landscapes, with acacias, bush, savannah… and potencial wildlife. Yes, we saw from the bus, many zebras and antelopes, giraffes, buffalos, baboons… and far away elephants... and a few camels. Luck! It´s the western Laikipia area, famous for the high density of wildlife and many private ranches and reserves (you´ll see the fences). Finally, the most interesting part in this authentic African experience is the traditional tribes with their cattle and villages. Beautiful and original Samburu people! There are no tourists in the area, except for the camel race, what you really can experience here is often not well describe on the guide-books. Great! Maralal is real old Africa in Kenya. Fantastic tribes, Traditionnal villages, and Wild life! We went to Maralal cause local people in Nyahururu asked us "are you going to Maralal?" and we started to enquire about that place. Mararal itself is just a small town in the middle of nowhere, arid and remote Kenya. Land of Samburu tribe, cattle and wild life on the way. If you have no time to reach Maralal, just head to Rumuruti, 40 km north of Nyahururu (tarred road, matatus). You will see tha Samburu people around. Nyahururu is the departure town for Mararal. We went from Naivasha to Nyahururu, slept there and continued to Mararal. Matatu Naivasha-Nyahururu, 300 sh, 2 h. From the 2 main stations in Naivasha (more with Nucleur). Different companies and departures, more in the morning, til around 16:00. From Nyahururu bus station. Maralal - Nyahururu: the way back price is 400 sh (cheaper) and a bit shorter. Most of the buses leave at night, from 1:00 til around 4:00 and the last ones at 8:00-9:00. Nyahururu-Maralal road: it´s a dirty road and long way (160 km). Only the first 40 km are tarmac til Rumuruti and then the road is really bumpy and bad (but for Kenyan people it´s “good” if you ask, say "it was much worse before" and some local people even use normal sedan Toyota cars!). Right now, 5 hours to do 160 km! They have just started to renew the road so maybe in a couple of years the tarmac road will be done. For good and for bad, cause maybe Maralal will change too fast like other Kenya areas. Hope not! Maralal- Isiolo: 200 km east, they told us it´s around 6 hours at least, and the dirty road is not too bad. Maralal- Lake Turkana area (north): more than 200 km and around 10 hours to Loiyangalani (1.000 sh), less to Baragoi, 6 hours (600 sh). But this road has some very bad sections. Maralal surroundings: many small trucks, jeeps, etc. for local villages. Maralal- Lake Baringo/Marigat (150 km-170 km): there´s no public transport... maybe only small shared cars... Not easy without a private car... The crossroad is 55 km south of Marigat on Nyahururu road, just in front of Mugie Ranch gate. 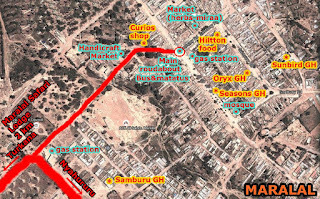 Maralal stage (transport departure) is just near the main roundabout. In town there are few options for cheap accommodation. A few basic local guesthouses with prices around 500 sh/room and a few better ones like Sunbird (1.000-1.500 sh/room) and Samburu (1.500-2.500 sh/room). All walking distance, Maralal is just a few streets. New lodges are opening, Maralal is growing. Oryx Guesthouse: where we stayed. Price: 500 sh, self-contained, single room (3/4 bed). Hot shower. Clean, basic, correct. Many small truck drivers stop here (yard), noisy when trucks have engine on. Just in Maralal center, between the mosque and Sunbird GH. Maralal Safari Lodge: outside Mararal center, 2 km on the Turkana road is the gate (then up for 500 mto get to the lodge). Camping is affordable (1.000 sh/2 people) but rooms are expensive (6.000 sh/2 people). Many butcheries with “nyama choma” and a few local “hoteli” with basic menu (really cheap). “Hiltton Hotel” was correct. The more expensive lodges in the center (Samburu, Sunbird, Seasons, etc. ) have also a restaurant, a bit more expensive than small places. Many small basic shops and a small mini-supermarket near the main center roundabout. A few people selling vegetables and some fruits around the main streets. There are banks with ATMs but better carry cash from Nyahururu just in case. A few internet shops. Mobile coverage. Just walk in town and meet the Samburu people tribe. Out of time! Men and women traditionnally dressed. Visit the small market selling crafts at the town´s entrance (west of main roundabout). For local people trade. Not tourist souvenirs but you can also buy, sure! 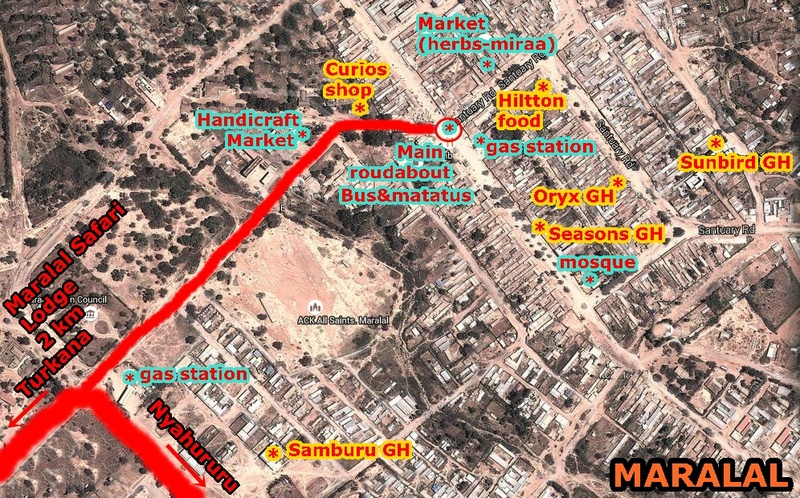 Go to miraa market (near the main roundabout), herbs and tobacco. Go to Maralal Safari Lodge: the lodge is surrounded by “sanctuary”, a small reserve with a few antilopes and monkeys. It´s free. Just around 3 km out of town. Also there you can see 2 "orphan" cheetahs. The owner offer us to see them for free (and think in a small donation). Maralal Curios Shop: you can find many crafts and locals buying there. 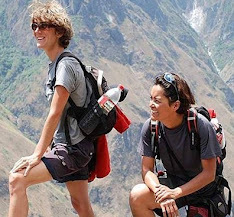 Also the place to contact guides, walking safaris and homestays in the area. Nice staff. Tonny Lokale 0728468876, Mohamed Abdilahi 07227911662 and Anthony Lepilale 0712337102. Every year, in august, it´s a 3 days event. 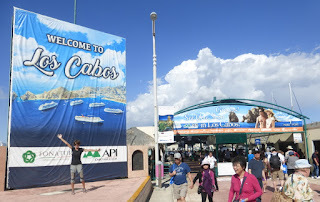 As the name says, it´s "international" so mainly focused for foreigners. It seems that they also do a mountain-bike race now. Mararal gets very crowded during those days. Outside that period, don´t expect to see camels around Maralal. We just saw a few ones on the Maralal-Nyahururu road. The gate is 55 km south of Maralal, on the Maralal-Nyahururu road. Truck-buses pass just in front of the gate. It´s a private wildlife reserve with a luxury lodge, in this great and wild Laikipia area. Wild animals, big 5, also predators (almost guarantee to see lions as they have location chips). It seems that you can hire a car there for a game drive for cheap, around 1.000 sh (10$). If this is true, Mugie can be a fantastic place in Kenya for a cheap game safari! This information was given by Maralal Safari Lodge owner. You can check their website even if they don´t explain about individual visits. Nyahururu is the highest town in Kenya (2.350 m), in the green Central Highlands. Cool weather. Just a dusty rural town, with many people shopping around, with the main road crossing the center. Access to Maralal. You will everything needed, banks, supermarkets, etc. Thomson Falls: very small waterfall (entrance fee: 200Sh), not very interesting, with local people disguised for the tourists (locals and foreigners), they look really fake. Many souvenirs shops. Just off the Nyeri rd, 2 km from the bus station. You can walk. Many buses and matatus, to Nairobi, Nakuru, Naivasha...and Maralal. Big station, nosiy, more or less organised. Many moto-taxis. - Naivasha-Nyahururu, matatu, 300 sh, 2 h.
- Nyahururu-Maralal, truck-bus, 500 sh, 5h. - Nyahurur-Nairobi: there are buses and matatus, they go via Naivasha on the main road. We prefered to transfer and go via Nyeri. The road goes north of the Aberdare NP and mountains and reaching Nyeri you will see Mount Kenya. - Nyahururu-Nyeri, matatu, 200 sh, 2 h (100 km). - Nyeri-Nairobi, matatu, 200 sh, 3 h-depending of Nairobi traffic jam (150 km). A few local cheap lodges in the center, better avoid the noisy main road. Safari Lodge: where we stayed. Price: 700 sh, single selfcontained room (3/4 bed). Hot shower, TV (only one channel). Very big room in a huge building, just in a back street near the main matatu station. Clean and quiet. Recommended. Staff not very smily. Old style lodge, just near the falls (you can see something from there). Rooms are expensive but there´s also a quite affordable campsite.